What Makes An Organization Adaptive? Because the sheer pace, volatility, and disruption can overwhelm leaders, many find themselves struggling to just execute on the current plan, let alone think about renewal activities or pilots that can improve productivity, create new products or services, improve customer satisfaction or market share. Sometimes your culture and existing organizational systems and programs are great at focusing people but can limit the necessary renewal activities that keep your organization relevant. Importantly, as our world gets more complicated leaders need to properly discern the best way to lead and run the organization. Sometimes, an activity or business or environment is stable enough that you can follow best practices and optimize for productivity and execution. However, in highly dynamic and volatile situations where the future simply cannot be known, it is imperative for the leadership team to focus the organization on rapid learning and experimentation. Discerning which environment your organization is operating in, and leading differently, is very challenging and requires a maturity of leadership and intentional approach to developing your people and systems that dynamically balances execution and experimentation. Quadrant 1 is the individual/internal aspect of change. This is the interior reality of people. It is the area of cognitive, psychological, and spiritual development. In this quadrant leaders attend to the inner development of people, recognizing that no substantive change is possible without a prior change in consciousness. Quadrant 2 has to do with the individual/external aspects of change. This is the domain of technical and interpersonal skills as well as the science (physiology/neurology/ psychology) of peak performance. This quadrant gets a great deal of attention from coaches and world-class athletes. It is where leaders pay attention to developing peoples’ skills and supporting the physical and psychological ingredients that spark motivation and peak performance. 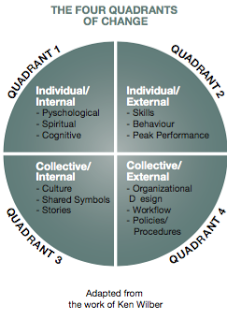 Quadrant 3 deals with the collective/ internal aspects of change. This is the domain of culture. It is the interior, often hidden, territory of our shared assumptions and images that direct what happens when we come together. This is the domain of myth, story, unwritten rules, and beliefs. It reminds leaders to pay attention to the deeper meanings of symbols, purpose, vision, and values-not so much as written, framed, statements, but, as the subtle messages encoded in our day-to-day interactions. You can think of quadrants 1 and 3 as the inner game, the operating system of the individual and organization. Execution and experimentation happen obviously at the individual and collective level and the probability of making progress is dramatically enhanced when all four quadrants are addressed and aligned in service of an energizing vision. It’s been my experience that most leaders focus on the external quadrants (2 and 4) and struggle with the inner. If we’ve learned one key thing it’s that the inner game always drives the outer game. When organizations get this right, it’s transformative to your business and industry. See how our recruiting, executive coaching for individuals and teams, customized leadership development programs, and culture and organizational development services can help you boost your company’s adaptability.